Most dental patients think that flossing is important to remove food particles that are left in between your teeth. While removing uncomfortable food debris is a great benefit that flossing brings you, flossing does 40% of the work to remove sticky bacteria and plaque from your teeth. Plaque generates acid, which can cause cavities, decay, irritated gums, and gum disease. If you think about it, each of your teeth has 5 surfaces: the front, back, top, left side, and right side. If you skip out on flossing, you’re leaving two sides of each tooth exposed to harmful plaque and bacteria. If you have trouble flossing or forget to at night, you can keep floss by your bed, so you don’t have to get up. If you have mobility issues, arthritis, or maybe you just don’t like handling floss, try using pre-strung floss picks. These are easy, disposable tools that have a little string of floss at the ready to remove plaque from in between your pearly whites. 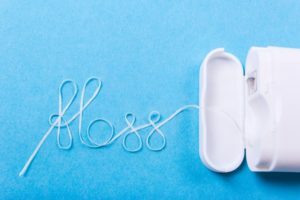 Flossing is one of the main ways to prevent gum disease, which can lead to an unhealthy looking and feeling smile, as well as overall health problems. Flossing removes bacteria that likes to live at your gumline. Bacteria is a main instigator for gum disease, and it can cause your gums to become red, puffy, swollen, or bleeding. Besides gum disease, lack of flossing can also be a leading cause for cavities and tooth decay. Even if you have a great brushing routine, without floss to clean in between your teeth, you’re leaving harmful plaque that turns into acid in your mouth. This acid will eat away at your enamel causing tooth decay that isn’t always obvious because it occurs on the sides of your teeth. If gum disease and cavities aren’t reason enough to start flossing, your social life could suffer too. Lack of flossing can cause bacteria to grow in between your teeth, which causes bad breath. If you’re noticing regular bad breath, try flossing daily to remove old food and bacteria from your smile. Flossing is an integral part of your oral health routine along with brushing and regular visits to your Melbourne dentist. Now that you know the real reason to floss, make sure to work this smile saving maintenance into your healthcare routine. Dr. Beverly Rose has been running her own practice in the Melbourne area since 1996. She enjoys providing the best care possible to her patients. She likes to stress the importance of good oral healthcare like flossing, so your smile stays healthy and beautiful. She can be contacted through her website or by phone at (321) 259-4666 for any questions.